Home » Sorted By Manufacturer » Staedtler » I took the Pepsi Challenge! 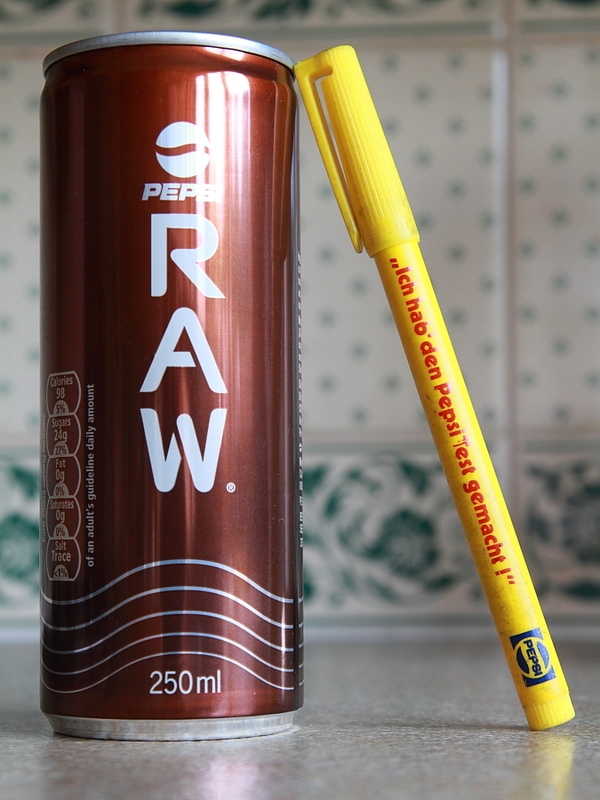 In one of my previous blog posts I mentioned Staedtler’s Pepsi pen. Having found it in a pencil case, where it was hibernating together with its cousin, Staedtler’s Microfix S 0.5 773 05, I want to show you some photos of this nice Pepsi pen. After spending more than 30 years in a pencil case with pencils and mechanical pencils this pen did get some traces of graphite on its nice, yellow body, but despite its age it does still write. "I took the Pepsi Challenge !" My previous blog posts mentioned the TWSBI Diamond 530, too. After having used the Diamond 530 for a while I have to say that it is a great fountain pen, but if you ever drop it by mistake it will spill rather huge amounts of ink, unlike other fountain pens I normally use – which have a much more conservative spillage-behaviour. Impressive that it still writes after all this time! I’m more taken by the can of Pepsi Raw, though. As far as I’ve been able to determine, it’s discontinued, which is a shame because it was my second favourite soft-drink. Do you have a secret stockpile of it, or did you luck out and find it in a supermarket? In the 1980s I used the pen until it didn’t write so well any more. It still writes “as poorly” as when I stowed it away – didn’t get worse. About Pepsi Raw, I do have a stockpile of it, but it’s over it’s BBE date. I don’t think there’s any UK stock left that hasn’t expired yet.